Are you looking for a fun way to mix up your book club programming? Reach out to your community and bring in special, local guests to visit book club! 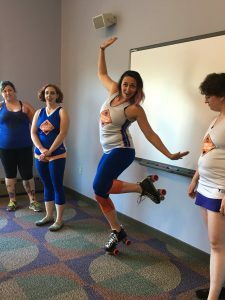 I recently lead a great meeting of “Going Graphic”, my tween graphic novel book club, which included a visit from members of Cleveland’s very own roller derby league! 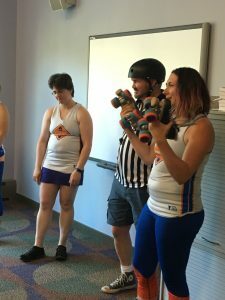 You might be saying, “Roller derby in the library? 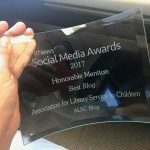 No way!” but this was a very successful program that brought together some of my most favorite facets of librarianship: community involvement, promoting literacy, and discussing graphic novels. In case you have yet to read Roller Girl (what are you waiting for?! ), it is a stand-out graphic novel for middle-grade readers and a 2016 Newbery Honor book. 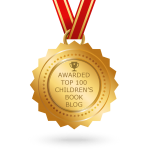 The story follows twelve-year old Astrid, who is inspired to join a summer youth roller derby camp after her mother takes her to a Rose City Rollers derby match. Astrid immediately falls in love with the sport and aspires to be like the rad roller ladies, whose colored hair, witty names, and rainbow socks absolutely scream cool. Unfortunately, Astrid’s best friend Nicole doesn’t seem quite so impressed by the roller derby. Soon after Astrid discovers that her bestie will be spending her summer at ballet camp with one of her not-so-favorite people, Rachel. So begins Astrid’s summer of growth as she learns that sometimes friendships change and that skating is not quite as easy as it looks. 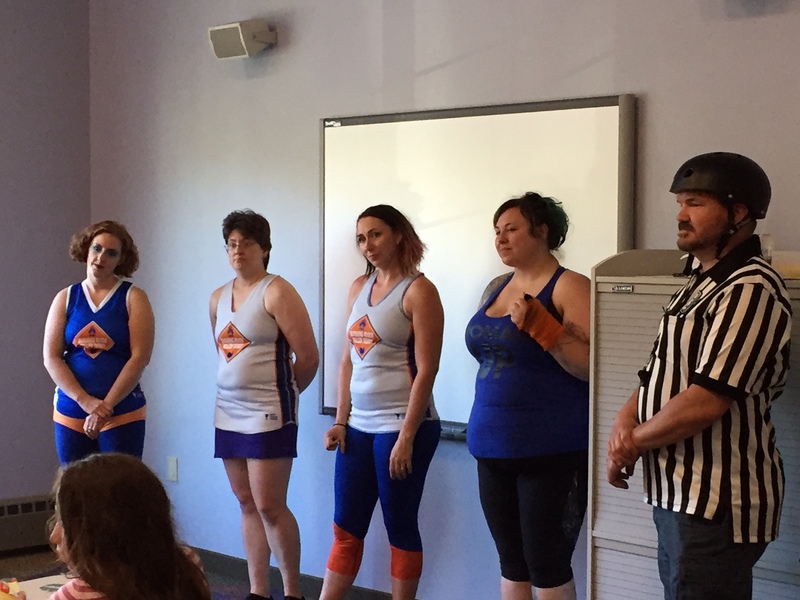 Four derby skaters and a referee from Burning River Roller Derby visiting book club! Photo by Nicole Martin. 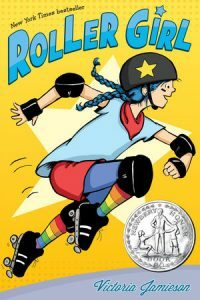 Our copies of Roller Girl had been flying off the shelves, and some tweens had shared with me that they had personal copies at home because they loved the book so much, so it seemed like a perfect choice for our summer “Going Graphic” topic. As an added bonus, it also ties in with the Collaborative Summer Reading Program theme this year which is all about sports and wellness! I reached out to the amazing people at Burning River Roller Derby, Cleveland’s very own roller derby league, to inquire about some team members visiting book club, and they excitedly agreed to visit at no cost! 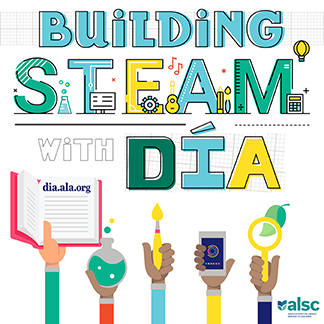 The summer book club program is for students completing grades 4-6 and lasts 45 minutes. We met on a Monday evening and kids were asked to have read the book before our meeting. If you are interested in leading a similar program, here is a quick breakdown of how the meeting went down! Ice Breaker Activity (5 minutes): As the kids arrived, they grabbed their name tags and took a seat at one of the tables. I typically arrange them in a horseshoe shape so we can all look at each other and talk without feeling like we are in a classroom. At each seat was a list of literary inspired roller derby names for them to discuss, laugh about, pick out and even write their own derby name creation. My favorite of the group was “Princess Slaya”!. Discussion (15 minutes): Participants went around the room and gave a thumbs up or thumbs down and shared their favorite part of the book. We also did some quick prep for what we would ask our special guests. Fancy footwork from a Burning River Roller Derby visitor! Photo by Nicole Martin. Special Guests Presentation, Q&A, and Skating Demo (25 minutes): 4 roller derby skaters and one referee from Burning River Roller Derby arrived to give a short presentation about Cleveland’s derby team, their own histories with roller derby, and how roller derby is played. The tweens asked some really great questions about practicing, how they pick their cool names, and hair colors. The last bit of the program was spent viewing some skating moves! 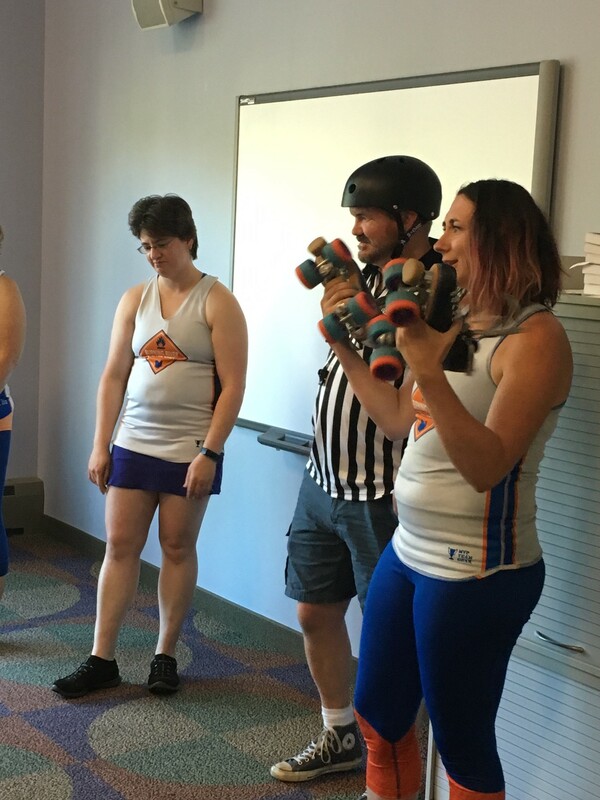 One of our special guests was kind enough to show off her gear and even put on her skates and show us some fancy footwork. The kids especially loved this part (and so did I!). Bonus- Autographing Session: Some of the participants had brought their own personal copies of Roller Girl and asked the skaters if they would autograph their books, which was such an awesome surprise. The skaters were all more than happy to autograph their books and the other kids had their derby name sheets autographed. Many smiles were seen as they left the library! This was my first in-person guest visit for a book club and will totally plan more guests in the future after this garnered such a positive response. Have you had any special guests attend youth book clubs? Do you have any recommendations for special guests that tie in perfectly with a tween book club title? Share your ideas in the comments below! Derby members show off their skates and other gear. Photo by Nicole Martin. Our Book Club for Kids had a special guest when we read Grace (American Girl series) by Mary Casanova. We choose the book because of the local ties to our community. Grace lives along the Blackstone River Valley in MA while our library is also in the Blackstone River Valley but in RI. Throughout the three books in the series, connections to local spots like Slater Mill (across the street from our library! ), a train ride through the Blackstone River Valley, and the Blackstone Bikepath are mentioned. Special Guest Donna Houle, Special Projects Manager for the Blackstone Valley Tourism Council came to visit our club and talked to the kids about how she helped the author with information about the Blackstone Valley area, where Grace lives in the books. It was also interesting to hear about how she was also consulted when the movie version of this book was being made. Donna is even credited at the beginning of the book for her help! Not as exciting as Roller Derby members but it was still interesting to have a special guest.